Bisi Adeleye-Fayemi is a feminist activist, writer and thinker. She has many years of experience as a gender specialist, social entrepreneur, policy advocate, and social change philanthropy practitioner. She co-founded the African Women’s Development Fund, (AWDF) – the first Africa-wide grant-making fund, and served as the first Executive Director from 2001-2010. AWDF has played a key role in the promotion of feminist movement building in Africa. She is currently Principal Partner, Amandla Consulting, specializing in leadership development for women, and she runs an online community called Abovewhispers.com. She is a UN Women Nigeria Senior Advisor, and was recently appointed as a Visiting Senior Research Fellow at King’s College, University of London. When her husband Dr Kayode Fayemi took office as Governor of Ekiti State, Nigeria, October 16th 2010-2014, Bisi became actively involved in a range of policy advocacy, grassroots empowerment and social inclusion programs in Ekiti State. She led the campaign to enact a Gender Based Violence Prohibition Law (2011) an Equal Opportunities Bill (2013) and a HIV Anti-Stigma Bill (2014). She serves on the Executive Boards of the African Women’s Development Fund, and the Global Fund for Women USA. She is Chair of the Advisory Council of the Nigerian Women’s Trust Fund and also serves on the Governing Council of Elizade University, Nigeria. Bisi is the author of ‘Speaking for Myself’: Perspectives on Social, Political and Feminist Activism in Africa (2013), ‘Speaking above a Whisper’, (2013) an autobiography and ‘Loud Whispers’ (2017) She also co-edited ‘Voice, Power and Soul’, with Jessica Horn (2008) a compilation of images and stories of African Feminists. Bisi Adeleye-Fayemi was born in Liverpool, England on June 11, 1963. She has a BA (1984) and MA (1988) in History from the University of Ife, Nigeria (now Obafemi Awolowo University). She also received an MA in Gender and Society (1992) from Middlesex University, UK. She has experience as a Feminist Thinker and Writer, Social Entrepreneur, Policy Advocate, Trainer, Social Change Philanthropy Practitioner, Communications Specialist and Social Sector expert. She is currently Principal Partner, Amandla Consulting, specializing in leadership development for women, and she runs an online community called Abovewhispers.com, where she writes an immensely popular weekly column called Loud Whispers. She is a UN Women Nigeria Senior Advisor, and was recently appointed as a Visiting Senior Research Fellow at King’s College, University of London. She served as the Director of Akina Mama wa Afrika (AMwA), an international development organisation for African women based in London, UK, from 1991-2001 as well as Executive Director of the African Women’s Development Fund, (AWDF) – the first Africa-wide grant-making fund, which supports the work of organizations promoting women’s rights in Africa, from 2001-2010. During her years in the UK, Bisi Fayemi worked in the Department of Health as an Administrative Officer. She then became the Director of Akina Mama wa Afrika (AMwA), an international development organisation for African women based in London, UK, with an Africa regional office in Kampala, Uganda, from 1991-2001. While she was the Director of AMwA, she established the African Women’s Leadership Institute (AWLI), a training and networking forum for young African women. The leadership institute she developed has become such a powerful legacy that today, the AWLI has trained over 6,000 women across Africa, and most of these women are now in senior decision-making positions as Ministers, Members of Parliaments, academics, civil society leaders and employees of international organisations. In 2000, Bisi co-founded the African Women’s Development Fund, (AWDF) – the first Africa-wide grant-making fund, which supports the work of organizations promoting women’s rights in Africa. Since it began grant-making in 2001, AWDF, based in Accra, Ghana, has supported over 1,200 women’s organisations in 42 African countries with millions of dollars in grants. AWDF has played a key role in the promotion and protection of women’s rights in Africa, through its support of grassroots initiatives, policy engagements and movement building for social justice. Bisi still serves on the AWDF Board, and is currently one of the three Co-Chairs of the Endowment Campaign of the African Women’s Development Fund, alongside Ms Graca Machel and President Ellen Johnson-Sirleaf. During her years in the United Kingdom, Bisi was very active in Pan-African organizing as well as political activism. She was a member of the Pan-African Movement, as well as a founding member of the New Nigerian Forum (NNF), an activist think-tank critical of military dictatorship in Nigeria. Alongside her husband Dr Kayode Fayemi and others, she worked tirelessly to draw attention to the many ways in which military rule was crippling Nigeria. She was Vice-Chair of the New Nigerian Forum as well as a member of the Editorial Board of Nigeria Now, a monthly newsletter published by NNF. Bisi is one of the most vocal women’s rights activists and thinkers on the African continent. During the years in which women’s rights issues began to receive attention in the global policy arena, she played a major role in ensuring that African women’s issues were addressed and their interests represented. She led a delegation of African women in Europe to the UN Human Rights Conference in Vienna, Austria in 1993 as part of the global campaign of ‘Women’s rights are human rights’. In 1995, she coordinated a delegation of twenty women from Africa and Europe to the UN World Conference on Women in Beijing China, where amongst many other activities, she addressed one of the plenary sessions. She also served on the Women’s Committee of the African Union for several years. A recipient of numerous local and international awards, in 2005, she received an award from the Sigrid Rausing Trust (UK) for outstanding leadership in promoting women’s rights. The prize money for the award (£100,000) was used by AWDF to launch a special HIV/AIDS Fund for African women. Bisi leveraged this into millions of dollars which has supported hundreds of women-led HIV/AIDS initiatives across Africa. Bisi received the Distinguished Alumni award from the Faculty of Arts, Obafemi Awolowo University, Ile-Ife (2006), as well as an Achievers Award given by the African International Media Summit (2006) for promoting a positive image of Africa. 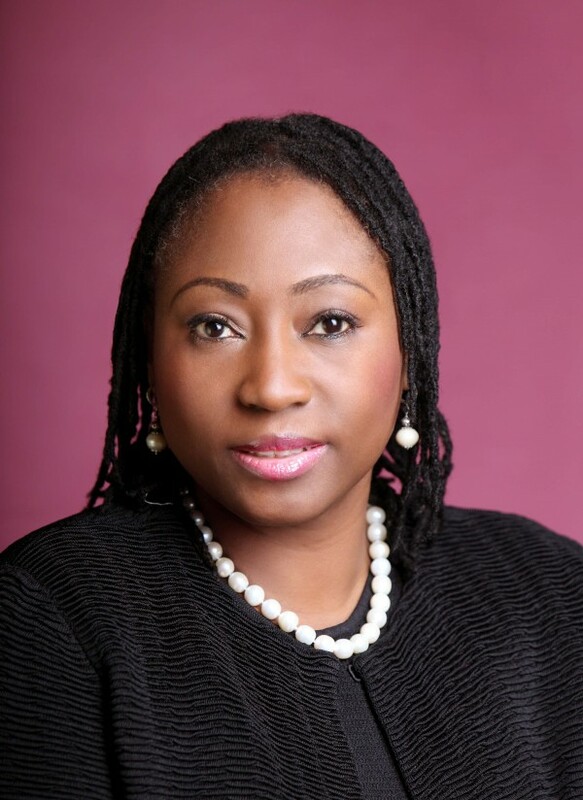 She is a 2007 recipient of the ‘Changing the Face of Philanthropy’ award from the Women’s Funding Network, USA. She is a Synergos Institute Senior Fellow, as well as the 2000/2001 holder of the Dame Nita Barrow Distinguished Visitorship at Ontario Institute for Studies in Education (OISE), University of Toronto. A Paul Harris Fellow of the Rotary Club as well as a Justice of Peace, Mrs. Fayemi holds the honorary traditional chieftaincy titles of Ochiorah (Women Leader) of Imezi Owa, Ezeagwu Local Government, Enugu State, Nigeria (April 2008), Erelu (Queen Mother) of lsan Kingdom, in Oye Local Government Area of Ekiti State (March 2011) as well as Ajiseye (Philanthropist) of Ado-Ekiti (December 2013). In April 2009, Mrs. Fayemi was named by New African Magazine as one of the 20 most influential African women on the continent. In March 2011, she was listed among the world’s leading 100 persons working for the interests of women and girls by Women Deliver. She is also the recipient of the 2011 David Rockefeller Bridging Leadership Award, one of the most prestigious awards in the field of philanthropy, given by the Synergos Institute, New York. When her husband Dr Kayode Fayemi was Governor of Ekiti State Nigeria (October 2010-October 2014) Bisi became actively involved in a range of policy, advocacy and social inclusion programs to support his administration. In addition to her ceremonial duties, she held statutory positions. She was the Chairperson of the Ekiti State Agency for the Control of HIV/AIDS (Ekiti SACA), as well as Chairperson of the Technical Consultative Committee on Culture, Arts and Tourism. In collaboration with other stakeholders, she led the campaign to enact a Gender Based Violence Prohibition Bill which was signed in to law in November 2011. She Chaired the Management Committee which monitored the implementation of the law in Ekiti State. The GBV Prohibition Law had provision for the first ever Survivor’s Fund in Nigeria, and through this, at least 70 women were supported to rebuild their lives after years of abuse. Her advocacy fast-tracked the establishment of the Family Court in Ekiti State, and her intervention led to the establishment of the first Ekiti Social Inclusion Center for the rehabilitation of women in distress. Bisi advocated for the domestication of the National Gender Policy, making Ekiti State the first State in Nigeria to do so. She also facilitated the passage of the Ekiti State Equal Opportunities Bill which became law in December 2013, as well as the HIV AIDS Anti-Stigma Law of 2014. A widely travelled global citizen whose work and advocacy has taken her to at least 75 countries on all continents, Bisi is a leading voice not only in the African women’s movement and civil society, but in the international development community as well. In addition to being a very respected leader in the field of international philanthropy, she is a renowned philanthropist in her own right. The former Ekiti State First Lady is the founder of the Ekiti Development Foundation (EDF), a non-governmental organization that focuses on women and youth development which was launched in June 2011. Since its establishment, EDF has supported hundreds of women’s groups and civil society organisations across Ekiti State with economic empowerment, health and political participation projects. EDF’s projects included the annual Ekiti Gender Summit, Mother and Child Records Book, the first of its kind in the State, Breast Cancer Awareness Campaigns and the Ekiti Food Bank. Bisi was the initiator of the Multiple Births Trust Fund in the State, the founder of the Forum of Spouses of Ekiti State Officials and founder/co-convener the Forum for Women in Leadership, Ekiti State. In memory of her friend and former Deputy Governor of Ekiti State, Mrs Funmi Olayinka, Mrs Fayemi, through the Ekiti Development Foundation, worked with the Ekiti State Government on the establishment of the Funmi Olayinka Diagnostic and Wellness Center based at the Ekiti State Teaching Hospital, which was launched in October 2013. In 2013, as part of her 50th birthday celebrations, Bisi asked her vast networks and contacts not to buy her expensive gifts or take out newspaper adverts, but to contribute towards the construction of a building to house the Center for Gender and Social Policy Studies which she donated to her Alma Mater, the Obafemi Awolowo University, Ile-Ife. The Center was launched on September 29th 2014. In November 2014, the Tai Solarin University of Education (TASUED) in Ogun State, Nigeria, awarded Bisi a PhD in Sociology (Honoris Causa). Bisi is in very high demand across the world as a resource person, strategist, guest speaker, trainer, and process manager. In June 2011, the New African Magazine named Mrs Fayemi as one of the 100 Most Influential People of Africa. Bisi is the author of ‘Speaking for Myself’: Perspectives on Social, Political and Feminist Activism (2013), ‘Speaking above a Whisper’, (2013) an autobiography and ‘Loud Whispers’ (2017). She also co-edited ‘Voice, Power and Soul’, with Jessica Horn (2008) a compilation of images and stories of African Feminists. According to friends and associates who shared their thoughts on Bisi in a recent book they wrote to celebrate her called ‘Signposts of Influence: Expositions on Bisi Adeleye-Fayemi (2014) she is variously described as ‘ a brilliant mind, a most generous and reliable friend, a woman of unique wisdom, a passionate leader and an exemplary role model’. Democratisation and Women in Africa: Progress, Stagnation or retreat? The KRONTI NE AKWAMU LECTURE 2011, published as a monograph by Center for Democratic Development, Ghana. ‘Speaking for myself’: Perspectives on Social, Political and Feminist Activism, Bisi Adeleye-Fayemi, October 2013. Appointed the Dame Nita Barrow Distinguished Visitor in Women and Development and Community Transformation for the academic year 2000/01, Ontario Institute for Studies in Education, University of Toronto, Canada. Selected to join the Synergos Institute’s Senior Fellows Program, a forum for senior leaders of philanthropic institutions, 2003-2005. Elected as President of Association for Women’s Rights in Development (AWID) 2004-2006. AWID is an international membership organisation of development thinkers and practitioners, with over 6,000 members in various parts of the world. Leadership award for promoting women’s rights, received from the Sigrid Rausing Trust (UK) September The award came with a cash prize of £100,000 for the African Women’s Development Fund. Winner, the Chairman’s Award, Pan-African Women Invent and Innovate, with Joana Foster and Hilda Tadria, organized by Global Women Invent and Innovate, in collaboration with the IFC, private sector arm of the World Bank, September 2005. Achiever’s Award from the African Communications Agency (ACA) at the Africa International Media Summit, Accra, September 2006, for promoting a positive image of Africa. Honorary Chietaincy titles: installed as the Ochiorah (People’s leader) of Imezi Owa, Ezeagwu Local Government, Enugu State, Nigeria, April 2008, Erelu (Queen Mother) of lsan Kingdom, in Oye Local Government Area of Ekiti State, March 2011, and Ajiseye (Philanthropic leader) of Ado-Ekiti, December 2013. In April 2009, named by New African Magazine as one of the 20 most influential African women on the continent. In 2011, named as one of the 100 most influential Africans by New African magazine. In March 2011, listed among the world’s leading 100 personalities working for the interests of women and girls by Women Deliver. Recipient of the 2011 David Rockefeller Bridging Leadership Award, one of the most prestigious awards in the field of philanthropy, given by the Synergos Institute, New York. Received a PhD in Sociology (Honoris Causa) from the Tai Solarin University of Education (TASUED) in November 2014. Numerous awards given by national and local organisations.